Samuel Egerton Brydges was at King’s from 1775 to 1780, having previously been at Maidstone Grammar School. 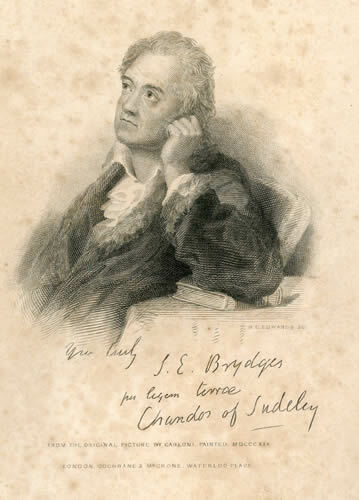 The Autobiography, Times, Opinions, and Contemporaries of Sir Egerton Brydges, published in 1834, has been described as “a confused and opinionated narrative of little interest”. It does, however, contain accounts of some of his contemporaries at School and is revealing of his own sensitive character: “nine years of struggle amid all the roughness of a school-life never hardened me”. “I was so timid on entering into school, and my spirits were so broken by separation from home, and the rudeness of my companions, that in my first schoolboy years I never enjoyed a moment of ease or cheerfulness. But I was perfect in my lessons, and never was punished during the nine years of my pupillage, for I got into no mischief or scrapes; and at Canterbury was, next to C. Abbott, (afterwards Lord Tenterden,) the head of my form.